Made of natural fur, this coat has a geometric and casual design, for women. 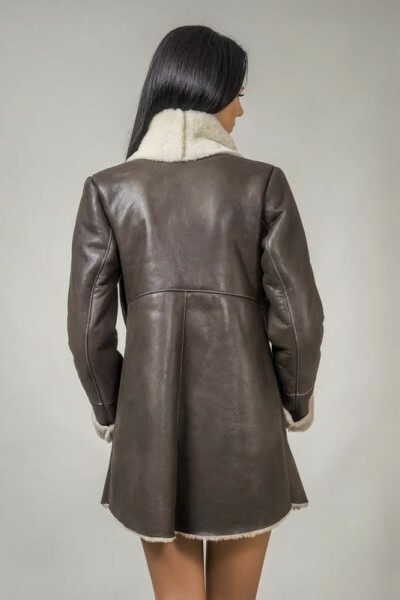 The exterior of this clothing is created of lamb nappa leather for protection and comfort, ensuring protection against moisture and dirt.This nappa lamb leather interior is created by merino natural fur trimmed to a thickness of 8 mm, the same with the coats collar and cuffs. The closing system is made using three assorted buttons. The tailoring of this handmade natural lamb fur jacket and its simple lines, highlight the desire of every woman to be feminine without any effort. This product is available in the following colors: beige, light brown, brown or black, choose the one that suits you best!